If you click on the photo above you can see a mix of postcard messages and photographs from a visit to Scotland in 2004. I fell in mad, mad, love with the area the year before while on vacation with my daughter Miranda. At the time of our visit in 2003, I was on the cusp of making a major career decision and I was scared as most would be of doing something I might regret. Deep inside most of us know when it is time to make a change, but we find ways to rationalize not moving on. Miranda and I traveled a bit that year doing an Outward Bound experience in Colorado, followed by our trip to the UK which included a few days in Amsterdam and Barcelona. It was during this break from my job that I began to enjoy my life again and somewhere along the way, I got my smile back. By my second visit in the spring of 2004, I had left my corporate job and was taking some time to figure out what to do next. 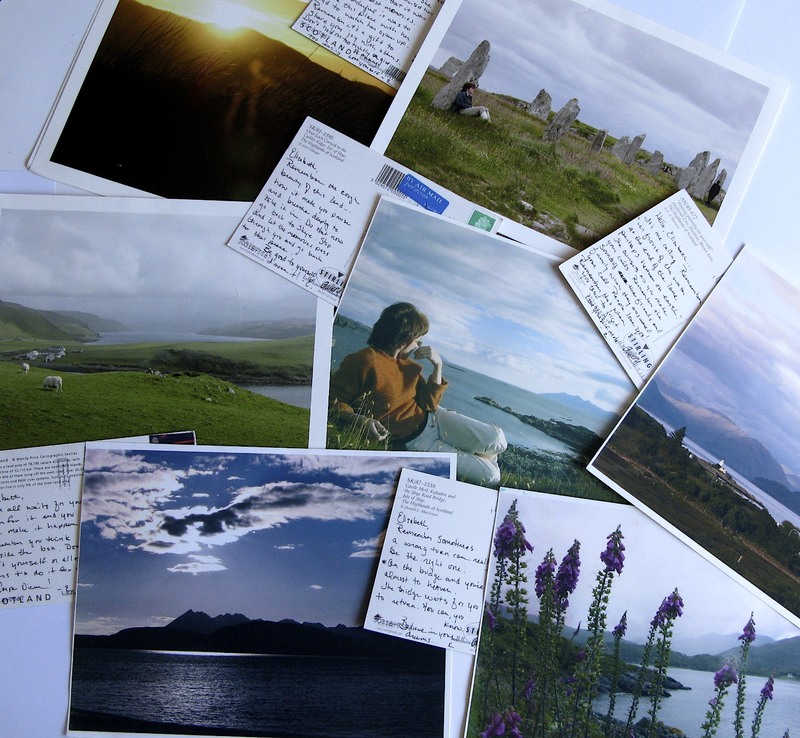 As I traveled around Scotland, I bought postcards in different locations and wrote messages on them before mailing them back myself in America. Friends who had picked up my mail and looked after my cats while I was gone joked with feigned huffiness that they had not received any postcards, but there were about ten waiting for me at home. 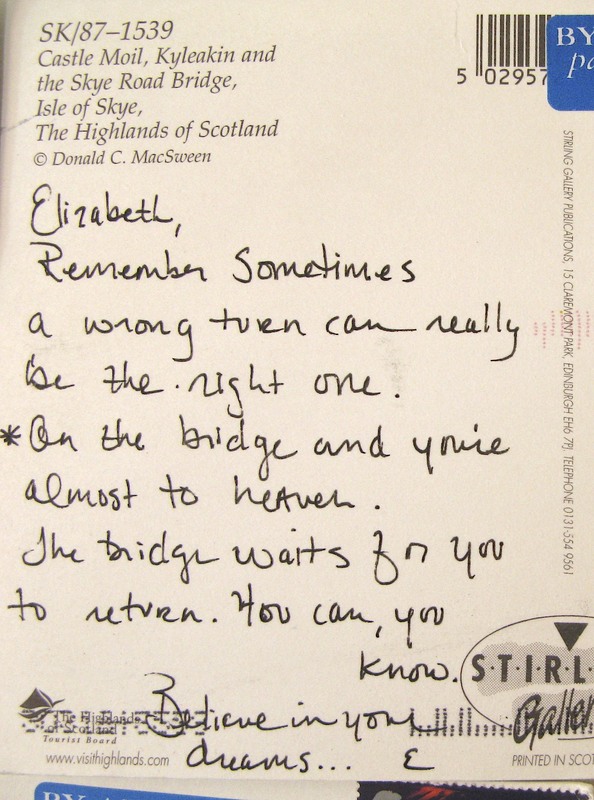 The card below is one of the ten and underneath it you can see a message I wrote to myself. I wrote the words above after taking a wrong turn at the end of the bridge that connects the Isle of Skye to the rest of Scotland. A wrong turn put me in a position to capture the image below reminding me that sometimes leaving the path is a good thing. Today a blogging friend of mine left her corporate life behind for a new one. Some of you may have seen Mariellen’s comments here at GOTJ. If you have not been by her place you should, she’s a great writer with tons of life experiences to share. I can’t wait to see the new directions she will go as she begins this next phase of her life. If you have a minute, I bet she would appreciate a kind message of support over at her place. 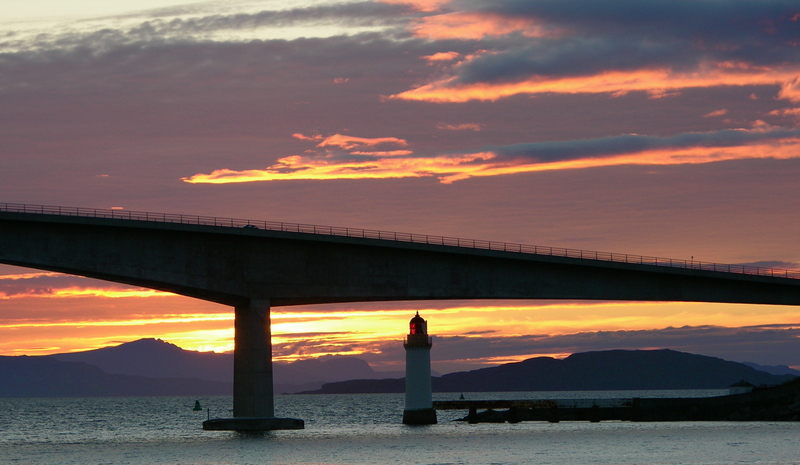 This entry was posted in Adventure, Bloggers, Choices, One Word - Encourage and tagged Career Changes, Gifts Of The Journey, Isle of Skye, Leaving Corporate Life, Mariellen Romer, Postcards To Myself, The Full Life. Bookmark the permalink. Hi Elizabeth, a wonderful post. You and your daughter had such a great trip, how brilliant that you got your smile back. I often sit and think about a path.. maybe this is my path, I am not sure. So pleased you took the leap of faith and it all worked out well for you. 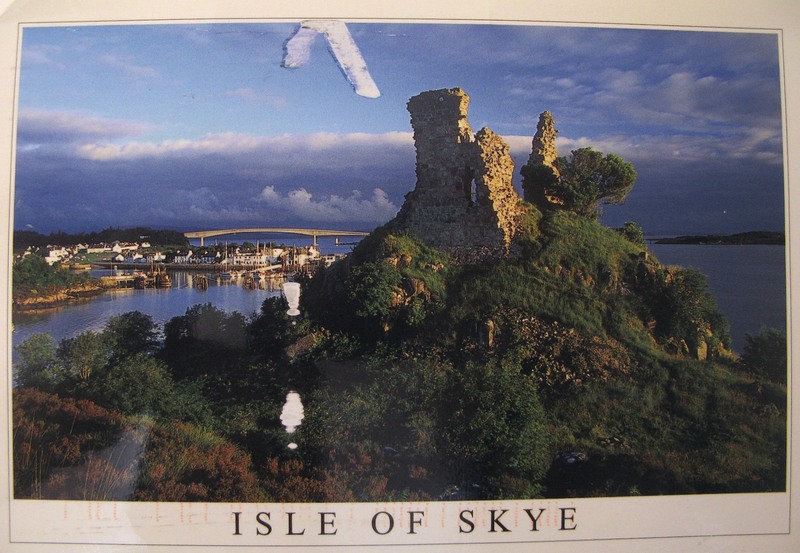 A wonderful postcard of Skye and such a great idea to send a card to yourself, I might do that next time. Thank you Elizabeth for your kind words and point to my post. I wondered where the traffic had come from, and when I saw your comment, all became clear. So here I am out the other side, alive and in one piece. I’ll blog about the leaving day later…right now, I have a suitcase to pack..! What a clever idea, to send post cards back to Home. Oldest son had a summer term in college in Scotland. He loved it there, kept a nice scrapbook. Your picture of the bridge is beautiful. It could be its own postcard. Having a crew of relatives — grandparents, aunts, uncles, etc. — who came to the U.S. from Scotland in the 1920s, I have a huge place in my heart for the country. And I can see how it would move you. While my son was in high school, my family and I got to visit mainland Scotland as well as Kirkwall, Orkney, where my grandfather was born. Such a magical place! Loved your post cards, too! That was an emotive write up Elizabeth. The Isle of Skye sounds like a magical place – both landscape wise, as well as for the soul. I am two months into a similar exploratory journey at the moment, and I relate very much to everything you have written here presently. Sending yourself postcards is a great idea!